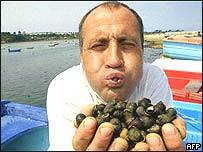 A French fisherman has won a world title in an event that definitely won't be on the programme at the Olympic Games this year - snail spitting. Reigning champion Alain Jourden, 43, retained his title by spitting the live creature a distance of 9.38 metres (31ft), said French news agency AFP. Challengers from 14 countries,including Belgium, Spain and the UK, took part in the event at the French port of Mogueriec. But they could not match the distance set by Mr Jourden. The 110 competitors are each allowed three snail-spits for the unusual event. And there appears to be a technique to sending the snail flying. Entrants roll the live snail in their mouths to get the right angle for propulsion, then run along a 20 metre track before spitting the mollusc into the air. An organiser said wind conditions were not favourable for this year's competition, which attracted 2,000 spectators. Mr Jourden told AFP he had trained hard for a week before the event, carrying out "several spits a day". He holds the world record of 10.4 metres. A British entrant broke his country's record when his snail reached 5.82 metres. A new female spitters' record was set at 4.10 metres and a child competitor, in the under 10 category, set a record distance of three metres.